Lie on your back with your feet together and arms beside your body. Breathe in and as you exhale, bring your right knee towards your chest and press the thigh on your abdomen with clasped hands. Breathe in again and as you exhale, lift your head and chest off the floor and touch your chin to your right knee. Hold it there, as you take deep, long breaths in and out. Checkpoint: As you exhale, tighten the grip of the hands on the knee and increase the pressure on the chest. As you inhale, loosen the grip. As you exhale, come back to the ground and relax. 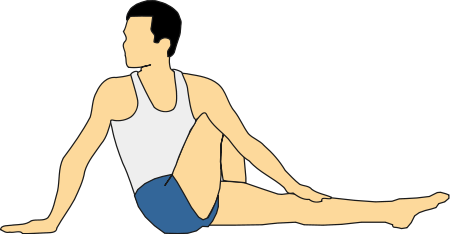 Repeat this pose with the left leg and then with both the legs together. You may rock up and down or roll from side to side 3-5 times and then relax. Yoga asanas will help you strengthen your back. Yoga do not just relieve your lower back from pain, but they also help to prevent back pain in future. This pose will help in spinal traction and lower back health. Stand Lie down on the floor facing the ground and place your hands in front of you. Flatten your palms on the floor. Lift your hips off the ground by balancing yourself on your feet and hands. Lift your hips as much as you can, till you feel a soothing stretch in your back. Take 5 to10 breaths in this position. Start with lying on the ground and place your hands in front of you. Lift your torso of the ground. Bring your right knee behind your right wrist. Stretch your left leg out behind you. Your knee should face the floor. Press your palms against the floor. Stretch your legs backward while you curve your back and lift it up. Pull your abdominal muscles to your spine and maintain this pose for 5 to 10 deep breaths. You need to sit on your heels. Place your head on the ground in front of you. Your hands should be behind your back. Breathe in slowly for 2 minutes. You can intensity the stretch by pulling your abdominal muscles towards your spine. The twist imposed on the spine makes the spinal column more flexible and stimulates the spinal nerves. It also has a strong influence on the abdominal muscles, alternately stretching and compressing them, as the body twists from one direction to the other. • Sit with the legs outstretched. • Sit up with the legs stretched straight in front of you, keeping the feet together and the spine erect. • Place the left hand on the left knee; right hand behind you. • Twist to the right and look over the right shoulder. • Breathing out, come back to the front. • Repeat on the other side. • Breathing out, come back to the front and relax. 1. Stretches the spine, loosens the vertebrae and tones the nerves. 2. Vakrasana relieves back pain, neck pain, some forms of sciatica. Salabhasana strengthens the back and improves flexibility in the spinal muscles.The abdominal muscles become stronger, improving digestion. Stiffness is reduced in the neck and shoulders. • Lie face down on the floor with the arms beside the trunk, feet together, knees straight and the toes stretching back. • Turn the palms upward. Stretch the arms and raise them so that the hands are parallel to the floor. • Press the sacrum downward and raise the head, chest and legs as high as possible taking care there is no back pain. • Extend the trunk forward, the legs and arms backward and lift the chest. • Balance on the lower abdomen, look straight ahead and breathe normally. Hold the pose for 20-30 seconds and then release and lower the chest, head and legs. In everyday life we are continually bending forwards, but have little reason to bend backwards. Back bends help to extend the heart muscles, stretch the front side of the lungs and maintain flexibility in the respiratory muscles, thereby increasing lung capacity. They are also useful for nourishing and toning the abdominal organs and stimulating the adrenal glands. Don’t raise the arms and legs too high, as this will cause pain in the lower backstretch the shoulders back, keeping the arms parallel. Keep the legs together and the knees straight. If it is difficult to do the pose with the feet together, place a foam block between the feet, press the inner edges of the feet into the block and lift the legs. In order to open the chest more, and increase the extension in the arms, put a wooden block on the palm of each hand. Imagine the blocks are heavy weights, and without actually lifting the hands any higher, push the palms into the blocks as if trying to lift them. Tadasana yoga will teach you proper alignment that may help ward off new knee injuries and help you become aware of the muscles you need to engage to protect the knee. Stand with your feet together and the bases of your big toes touching, heels slightly apart (so that your second toes are parallel) and arms by the sides. Rock back and forth and side to side. Gradually reduce this swaying to a standstill, with your weight balanced evenly on the feet. Firm your thigh muscles and lift the knee caps, without hardening your lower belly. Lift the inner ankles to strengthen the inner arches. Turn the upper thighs slightly inward and lengthen your tailbone toward the floor. Press your shoulder blades into your back, then widen them across and release them down your back. Without pushing your lower front ribs forward, lift the top of your sternum straight toward the ceiling. Widen your collarbones. Hang your arms beside the torso. Balance the crown of your head directly over the center of your pelvis, with the underside of your chin parallel to the floor. Tadasana is usually the starting position for all the standing poses. But it’s useful to practice Tadasana as a pose in itself. Stay in the pose for 30 seconds to 1 minute, breathing easily. Practise 5 rounds. At first it may be difficult to maintain balance but with practise it becomes easier. This asana improves posture and develops balance. It strengthens thighs, knees, and ankles, firms abdomen and buttocks, Relieves sciatica, Reduces flat feet. The Bridge pose helps strengthen muscles in the knee joint and is also helpful for those suffering from osteoporosis. It also calms the brain and reduces anxiety and stress in the body. To begin, lie on your back. Fold your knees and keep your feet hip distance apart on the floor, 10-12 inches from your pelvis, with knees and ankles in a straight line. Keep your arms beside your body, palms facing down. Inhaling, slowly lift your lower back, middle back and upper back off the floor; gently roll in the shoulders; touch the chest to the chin without bringing the chin down, supporting your weight with your shoulders, arms and feet. Feel your bottom firm up in this pose. Both the thighs are parallel to each other and to the floor. If you wish, you could interlace the fingers and push the hands on the floor to lift the torso a little more up, or you could support your back with your palms. Hold the posture for a minute or two and exhale as you gently release the pose. Yoga asanas strengthen your back and release tension and stiffness from the shoulder area. By practising the asanas on a consistant basis, your back pain will be cured easily . First come to a kneeling position with hands on the waist. Gently bend backward, moving the pelvis forward and lifting the chest upward, keep the head up. Release the hands and one by one place the hands on the soles. Lift the upper torso a little higher and breathe deeply. To come out of the posture, release the hands, sit down on the heels and rest in child’s pose. Benefits: Improves the respiratory function, relieves tension and stiffness from shoulder area, makes the movement of the bones smoother. Sit on the floor. Bend left leg to place left knee on the floor and left heel against the right buttock. Place right foot on outside the left thigh. Sitting straight up place the right hand on the floor behind you. Twist your torso to the right, and press your left arm against the outside of the right leg to grasp right foot with left hand. If you have difficulty reaching the right foot, just press the left elbow against right knee, hand pointing upward in the air. Twist first from the waist, and then twist the rib cage and finally the shoulders. Look over your right shoulder. Keeps the right hip pressing down to the floor. Keep the spine straight. Relax both shoulders. Keep breathing. Hold. Benefits: Makes the spine supple, removes stiffness from the shoulders and neck, massages and tones abdominal organs. in the abdominal area and stimulates the stomach, colon, kidneys, liver, spleen and gall bladder.